There have been a lot of changes and updates in MyTEAM market in the past few months since NBA 2K17 was released. The 2K team is going to release the new NBA 2K17 Playoff Performers collection. As a result, there are some best Playoff Performers who are the athletes who will be included in the pack. The team has dropped some major details about it on NBA 2K17 MyTEAM Twitter. "Players elevate their games the highest during the Playoffs, including some superstars and some players enjoying the series or games of their lives on the NBA's grandest stage," the notes states, "this set includes players that have enjoyed some of the best Playoff performances or career-defining moments, Highly anticipated cards." 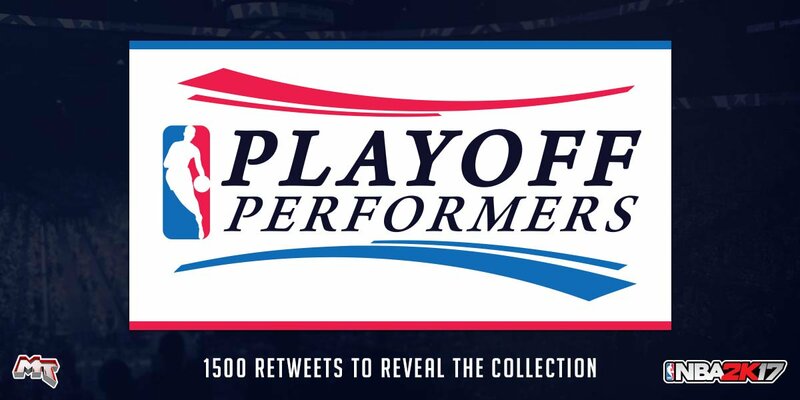 To reveal the new collection, NBA 2K17 MyTEAM ask fans for 1500 Retweet. 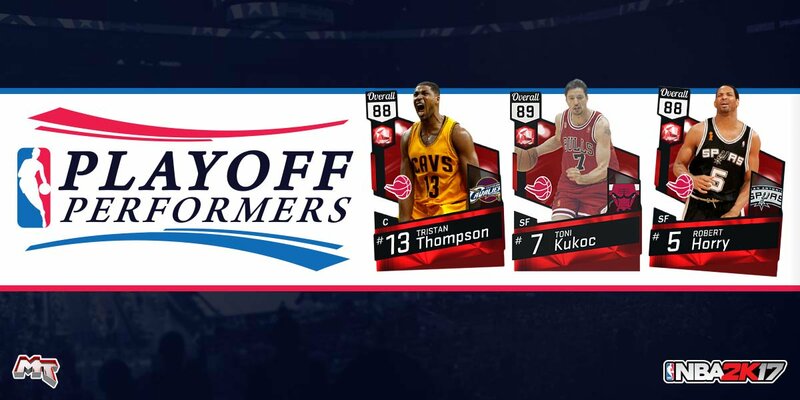 The first three cards released by 2K are Ruby players including Tristan Thompson with a 88 overall rating, Chicago Bulls' Toni Kukoc with 89 rating and Robert Horry who has 88 overall rating. 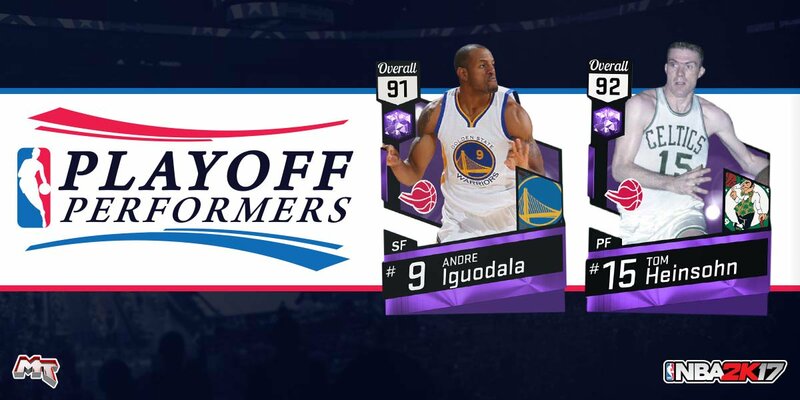 This collection including Amethyst cards consists of 91 rating Andre Iguodala who wins Finals MVP in Golden State for their 2015 Championship run and 92 rating Tom Heinsohn. 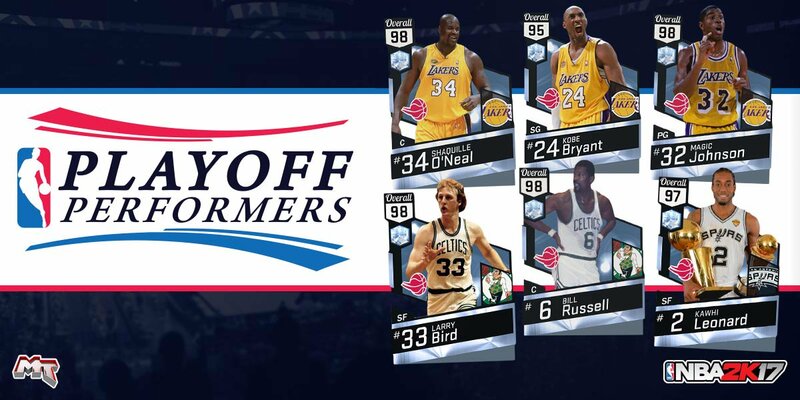 Then, 2K team revealed six Playoff Performers Diamond cards: fantastic and powerful Shaquille O'Neal who has a 98 Overall Center, 95 rating Kobe Bryant who is popular for his shooting and dunking abilities, the best Point Guard Magic Johnson card with 98 rating of the season, the greatest offensive and defensive players - 98 Overall Larry Bird and Bill Russell. The last Diamond player is Kwahi Leonard who has 97 overall rating. 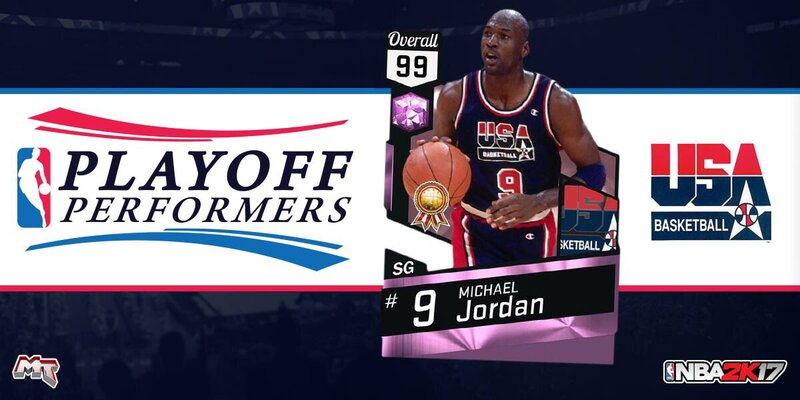 Don't miss out one of the Playoff Performers Pink Diamond players - the Pink Diamond Reward Michael Jordan! Get Team USA MJ who is widely considered the greatest player for collecting all Playoff Performers cards! Plus, you can get Pink Diamond Charles Barkley once you collect all of the Team USA Rewards for completing sets. 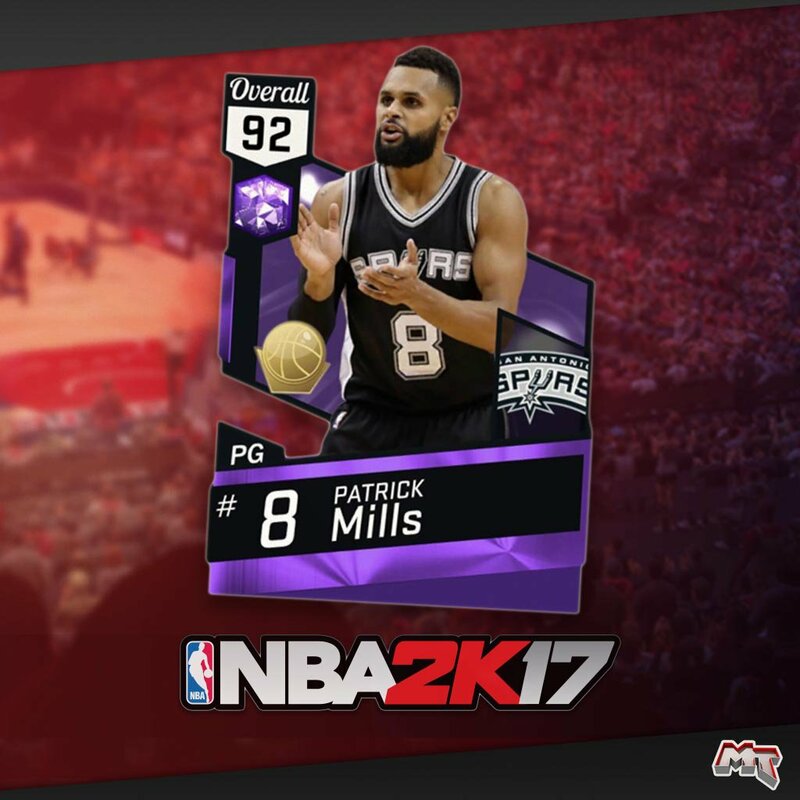 MyTEAM is giving Patrick Mills an Amethyst card to highlight his efforts this season. This card is available in Playoff Packs now.